Our garden, while pitifully destroyed in large portions by those rotten squash bugs, is at least producing a few things. We are enjoying what we can harvest at our meals. To keep in the garden them, I pulled out our mushroom and spider muffin cups. 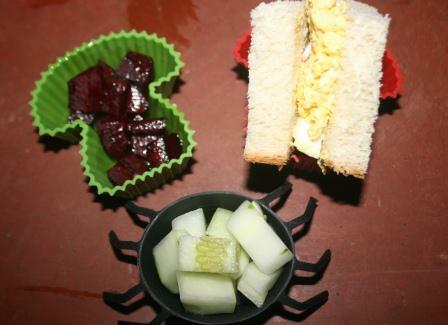 We had roasted beets, egg salad sandwiches on homemade white bread (the eggs were from our hens), and cucumbers. Pierce loved this meal and ate every last bite. Cort and Reid mostly ignored the veggies, but ate the sandwich. I love that you included a bug in the meal! This looks delicious! Sorry you have the squash bugs.It certainly seems to be the year of the bugs,they got a lot of my veggies too. I'm glad the squash bugs aren't getting everything at least! Very cute. Squash bugs are horrible. I didn't get any squash this year, but my tomatoes and peppers are doing well. Looks so yummy and I think I'll make me some egg salad for a lunchtime treat today. Looks good! Cute lunch there - and I'm all for egg salad myself! I love egg salad and I can only imagine how wonderful it would be made with fresh eggs! I love the spider! I've never had roasted beets--I bet they're good. Your kids are lucky to have such a devoted mom! Not a fan of beets....otherwise it looks good! What a fun lunch, and that it came from your own labour and land makes it even better! Such cute food presentation for your little un's. Your a cute mommy. I think the weather has destroyed most of our gardens. I try to water but it just isn't the same. Hope those bugs die and your garden produces more before long. I always enjoy seeing these. I go back to teaching next week. Would you pack my lunch?! okay- I am off to find out how to make roasted beets. A fun meal, I like how you allow your children to be so selective, we were always told about starving children in China.Selectivity offers good eating habits. You always have such nummy foods! I thought I commented on this but it must not of gone through. Hope you get rid of the rotten squash bugs. We still have some growing time left. I am thinking about doing another round of zucchini. Looks good to me! I had some yellow squash from my dad's garden today. Ours didn't grow for some reason.